The One with Studio Calico BLUEGRASS FARM Layouts! The BLUEGRASS FARM kits just went live at Studio Calico! The inspiration just kept on coming this month and I busted out SIX layouts! Description: I had so much fun designing this exclusive FLOWER background cut file for Studio Calico for the April kits! I used only the main BLUEGRASS FARM kit to create this entire layout. Journaling says: It is so fun to watch you paint and enjoy being artistic - the paintings you made with watercolors are truly beautiful and just waiting to be framed and hung in your room. You also love to take pictures and you have a natural gift. We love you! 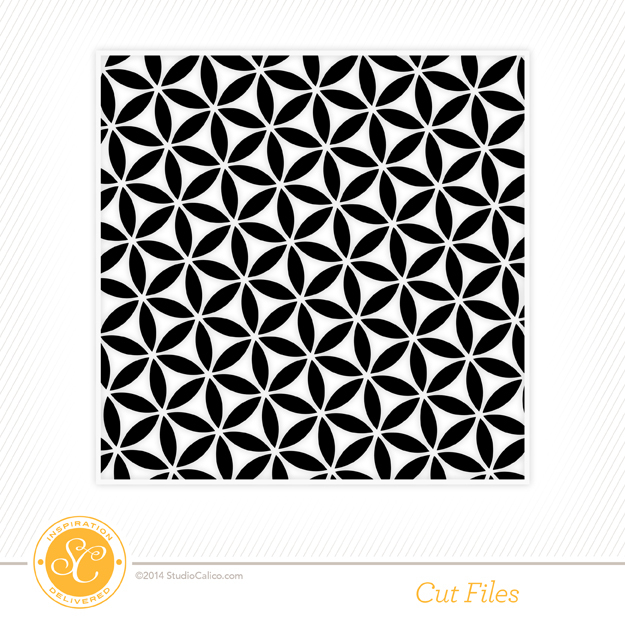 How to: Die cut the "flower background" I designed for this month's Studio Calico kits from white cardstock. Trim away a circle for a photo. I used the same cut file to make a single petal, enlarged it a bit, then made two rows in a new file. I cut the petals from all the patterned papers in the BLUEGRASS FARM main kit and adhered them to the back of the die cut cardstock using pop dots. 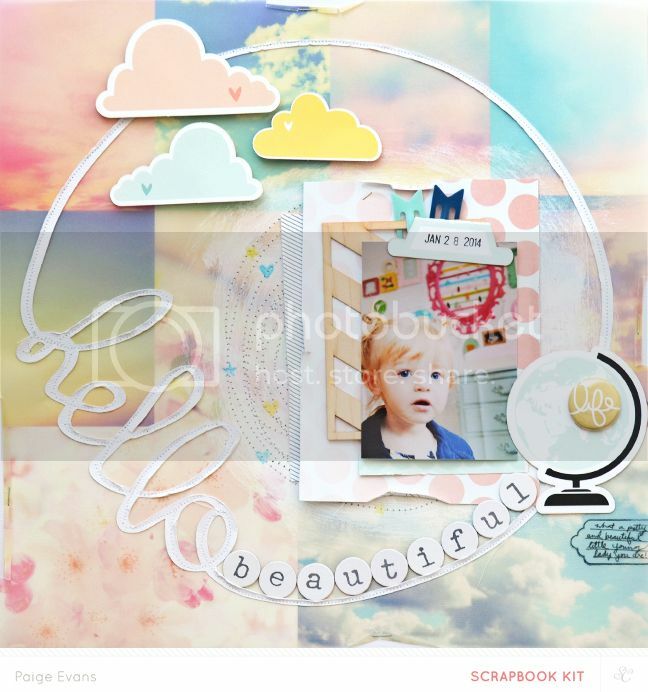 After placing the photo in the hole, embellish with little bits and pieces from the kit such as mini alphabet stickers, plastic letters on a wood tag, fabric patch, badges, label sticker, metal tab, and sentiment sticker as shown. Place a bunch of label stickers on the bottom left corner and journal on them. Stamp the date on the bottom label sticker. Description: I don't think I'll ever tire of the banner trend! 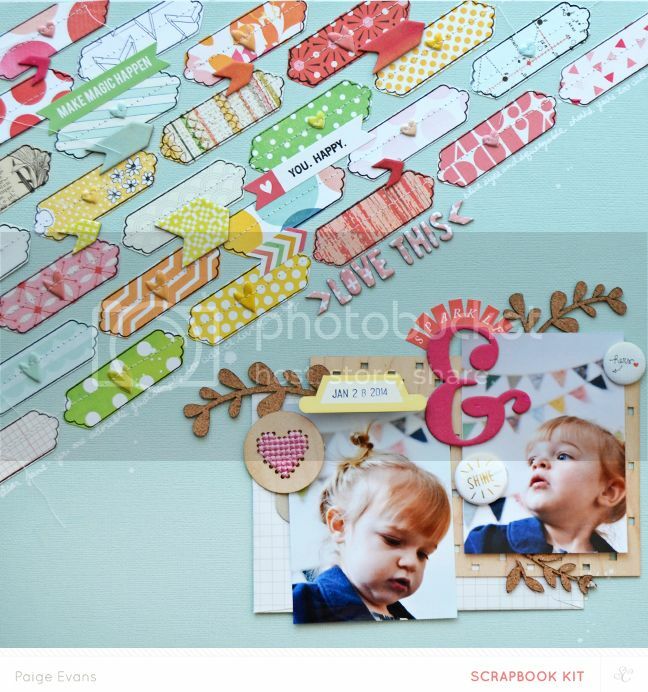 And when I saw the sneaks of the PIP add on kit with the fox stitchable wood veneer I freaked out! Perfect for a layout about Fox :) I combined papers and elements from all of the kits to make this layout: BLUEGRASS FARM, PIP, CLOVER, and BESSIE. Journaling says: It's true - you are such a handsome little fox, Fox! You got your good looks from your dad for sure! How to: Trim pennants from bold and more boy-ish themed papers from each of the kits, trim a photo into a pennant, and trim the journaling cards from the PIP kit into pennants. Line up the pennants into three banners then stitch across the tops. (Another plug for my STITCHED class - learn a couple dozen stitching techniques in this class I'll be teaching during the month of April at Studio Calico! It's definitely going to boost your creativity and the way you think about hand and machine stitching!) 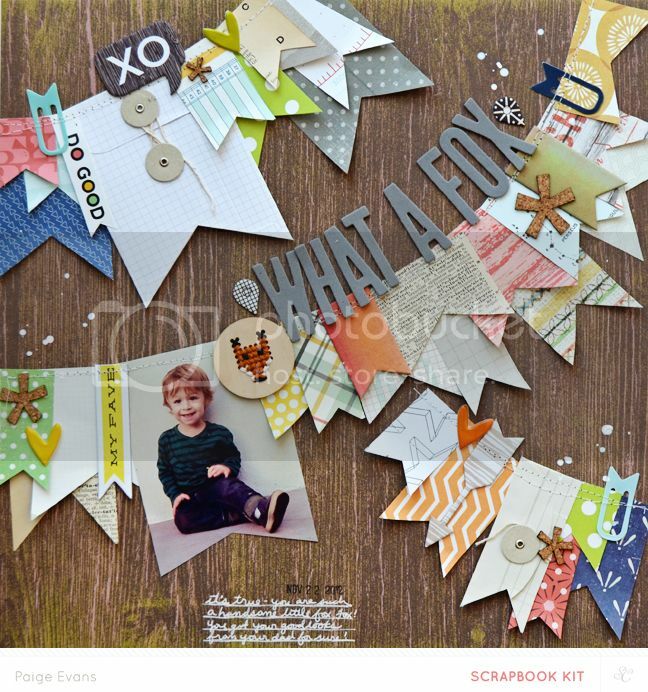 Add a dash of embellishments (such as plastic paper clips, cork asterisks, puffy heart stickers, chipboard arrows, geotags, and chevrons) around the layout and create a title above the longest banner. Journal with a white pen on the bottom edge and stamp the date above. Drop white spray mist around the layout to finish. 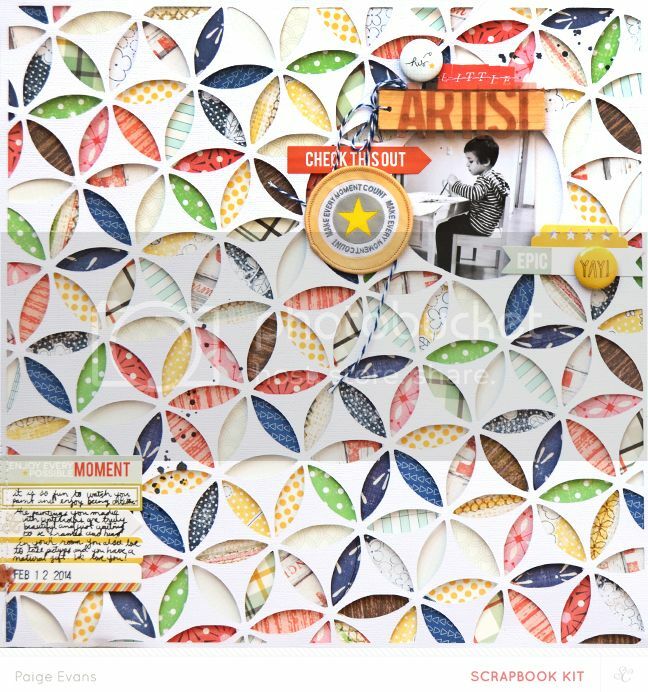 Description: I love repeating shapes and using patterned papers so when I saw the label stamp in the CLOVER add on kit I knew I wanted to use it to make a fun background! Journaling says: Dear Jane - you are adorable. Just simply too cute. I love your big blue eyes and squeezable cheeks. You're too cute. How to: Stamp the label on girly papers from all of the kits then fussy cut them out. Adhere the labels across the top left corner of a robin's egg blue cardstock layout base then stitch across each row. Embellish the labels with chipboard arrows, puffy hearts, a label sticker stamped with a sentiment, and more. Layer an envelope, wood veneer card, photos, cork leaves, badges, chipboard ampersand, and mini alphabet stickers on the bottom right corner. Stitch through a wood veneer heart using pink floss then add it to the photos. Journal under the last row of stamped labels then drop white spray mist arond the page. Description: When I'm stuck in a creative rut a simple grid design never fails! I love layering matching colored embellishments all together to create texture so that's where this layout comes from. Journaling says: Oh how I love giving you kisses and hugs and cuddles and snuggles! How to: Die cut a heart Polaroid frame from four colors of patterned paper then stitch around them to add texture and interest. 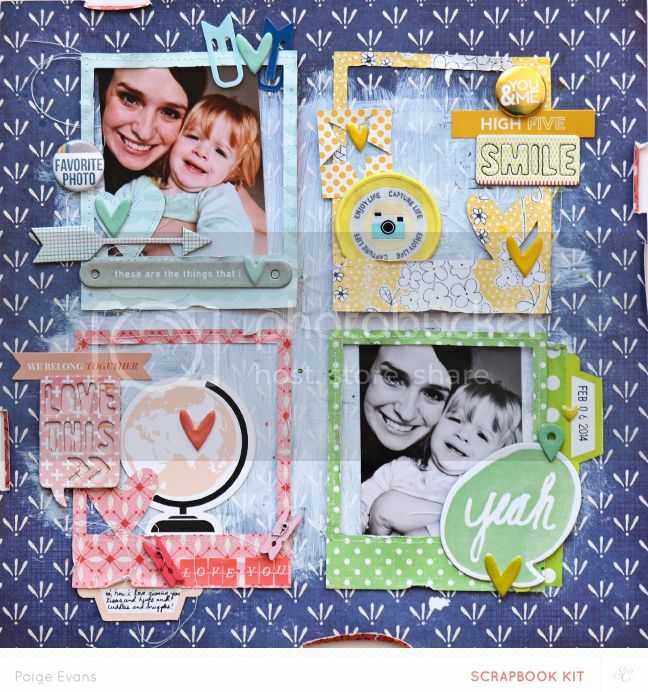 White wash a royal blue patterned paper layout base with paint then adhere the frames in a grid on top. Add two photos to the frames then fill in the frames with matching colored embellishments from all of the kits. I used mini clothespins, chipboard shapes, tabs, mini alphabet stickers, puffy hearts, die cuts, plastic paper clips, badges, patches, etc. So many fun little bits! Journaling says: What a pretty and beautiful little young lady you are! How to: Die cut the "hello" shaped circle I designed exclusively for Studio Calico for the April kits from white cardstock then stitch it to a cloud patterned vellum layout base. Crinkle a few edges of the vellum and staple them in place. Paint a circle on the center using white paint and stitch circles over it. Layer patterned papers, a wood veneer journaling card, photo, tab die cut with the date stamped on it, plastic paper clips, a badge, globe die cut, and more over the painting/stitching. Stamp a label on the bottom right corner and fill it with journaling. Place Thickers inside the ring to complete the title. Add three cloud die cuts with pop dots to the top. Journaling says: Here you are overlooking the beautiful city of Barcelona, Spain. I hope you remember all of these adventures! 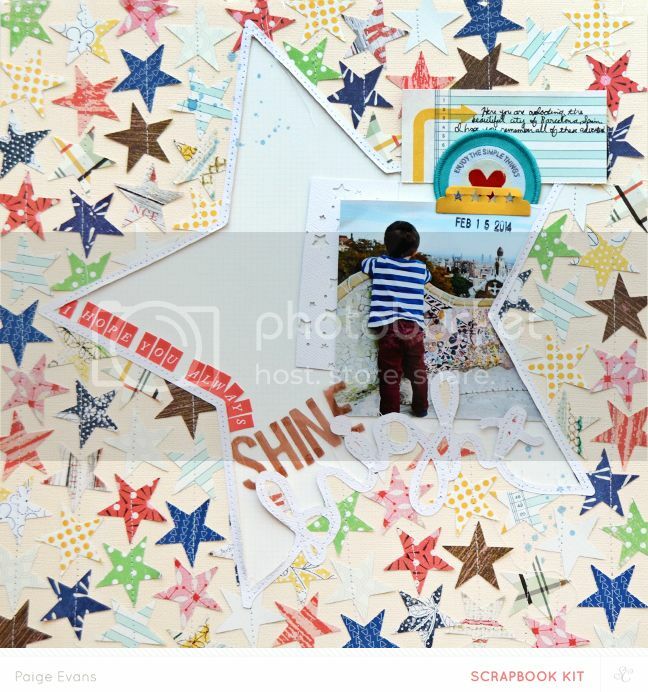 How to: Punch stars from the BLUEGRASS FARM kit papers then adhere them lightly to a cream cardstock layout base. Sew down each row of stars (stitching is a great way to adhere small pieces to a page! Learn more stitching techniques in my upcoming STITCHED class at Studio Calico I'll be teaching all throughout April!). 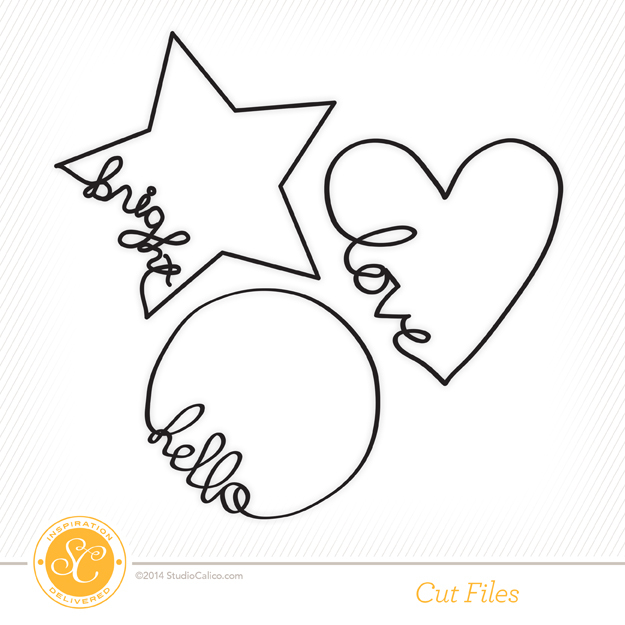 Die cut a "bright" star shape from white cardstock, stitch it to the center, carefully cut away the middle, then back the open hole with graph paper. Tuck a photo under the right side of the star. Add mini alphabet stickers and woodgrain plastic letters along the star to create the title. Embellish above the photo with a piece of ledger paper with journaling, a fabric patch, metal star tab, and the date stamped below. Drop blue spray mist over the layout to finish. That's all for now - until next month! These are all so amazing, Paige!! I can't pick a favorite!! And your cut files are awesome!! I just bought the shapes with the words! !